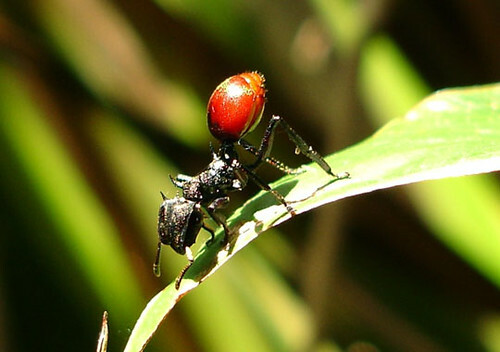 The ant’s infected and swollen abdomen does not actually take on a red pigment. of sunlight, it appears bright red. Image: Steve Yanoviak, University of Arkansas. 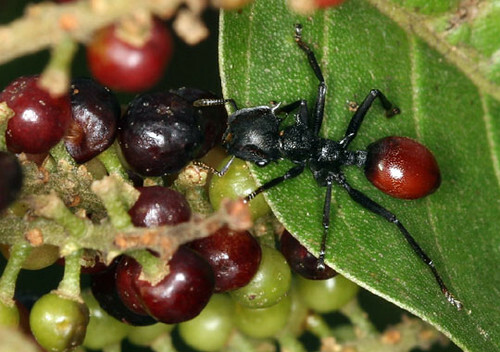 In the first known example of a parasite causing its animal host to mimic a ripe fruit, scientists have described a new parasitic worm that causes its neotropical black ant host, Cephalotes atratus, to resemble a luscious red berry that tempts hungry birds to eat it, thereby giving rise to a new generation of the worms. Normally, most birds will not eat ants because ants are small and crunchy with poor nutritional value, and worse, they sting and they taste terrible. However, birds can be tempted to consume the ant’s infected abdomen, or gaster as it’s called when it is swollen with mature parasite eggs, because its bright red color makes it resemble a tasty berry. Further, when infected, the gaster breaks off the ant’s black body easily, just as a ripe berry would break off a twig. Once consumed, the worm’s eggs pass through the bird’s digestive tract and are pooped out, along with undigested remnants of the bird’s other recent meals. Uninfected ants then collect these food-rich bird feces to feed to their larvae, which become infected with a new generation of the parasites. 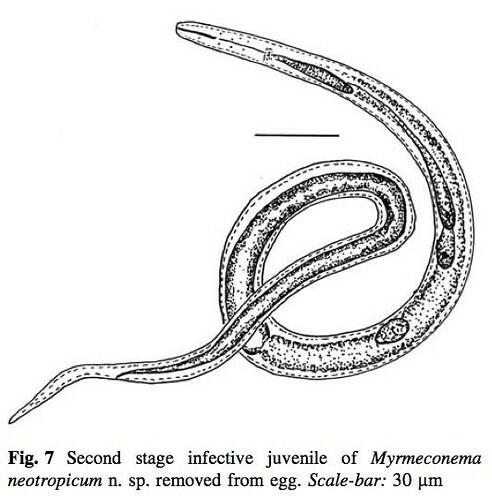 The above image depicts the second stage infective juvenile Myrmeconema neotropicum, which is the form found in the mature eggs that the birds poop out. In this case, the juvenile was removed from the egg and photographed with a microscope and drawn for publication by a scientific illustrator. How do the nematode eggs cause the black ant’s abdomen to become red in color? The research team, George Poinar, the world’s authority on nematodes that parasitize insects, and Stephen Yanoviak, an insect ecologist and assistant professor of biology at the University of Arkansas at Little Rock, have several hypotheses they want to test. “We think the worms either sequester pigment compounds from the exoskeleton or they make the exoskeleton thinner — or maybe both,” said Yanoviak. The team is already studying the gaster’s red coloration to determine what role, if any, it plays in the parasite’s life cycle. This paper will be published in the February issue of the journal, Systematic Parasitology. Poinar, G., Yanoviak, S.P. (2008). Myrmeconema neotropicum n. g., n. sp., a new tetradonematid nematode parasitising South American populations of Cephalotes atratus (Hymenoptera: Formicidae), with the discovery of an apparent parasite-induced host morph. Systematic Parasitology, 69(2), 145-153 | DOI 10.1007/s11230-007-9125-3 [PDF] (image). This entry was posted in Brain & Behavior, Evolution, Insects, Journal Club, Zoology and tagged adaptation, bpr3.org/?p=52, Cephalotes atratus, coevolution, evolution, fruit mimicry, Myrmeconema neotropicum, nematodes, neotropical ants, parasites, peer-reviewed paper, peer-reviewed research, tetradonematid nematode. Bookmark the permalink. Interesting that the bird is just a transport system. Pretty cool (unless you are an ant). If this happened in humans the NIH would spend $100 million to find the genes that slightly correlate with this phenomenon.